2013 - What are you harvesting? 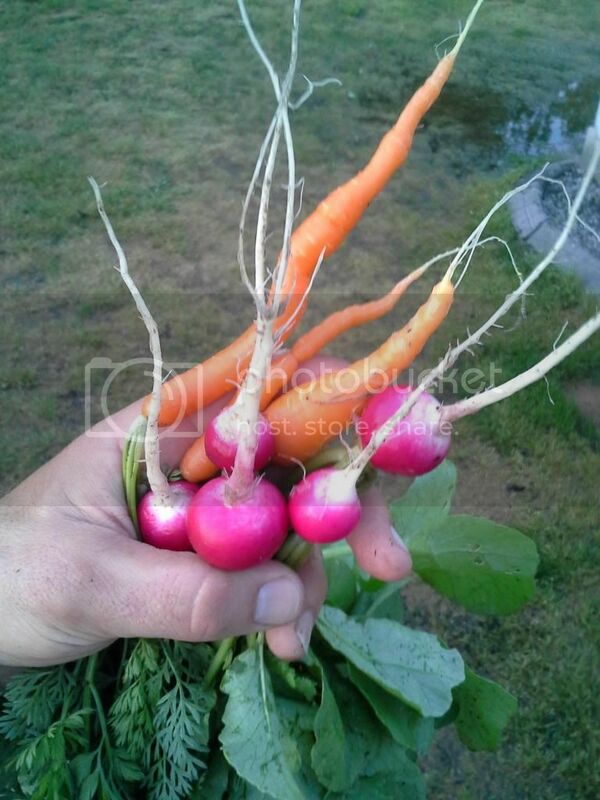 Steady supply of radishes each day. 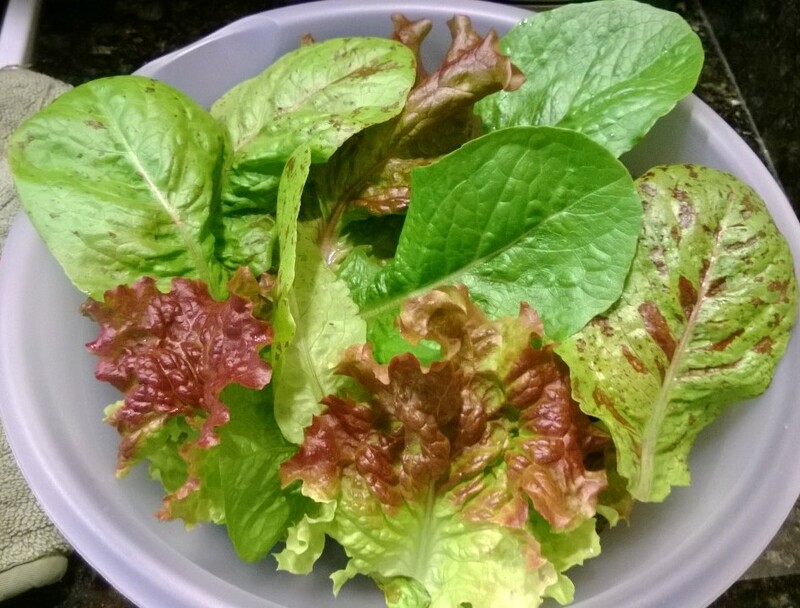 Steady supply of salad greens: lettuce, arugula, spinach. Plenty of cilantro and parsley. Abundant supply of spring onions. Garlic with tops, bulbs are just starting to form, but immature garlic is providing 100% of garlic needs from now until harvest of mature bulbs. Blueberries are coming in at a trickle. Swiss chard is about a week away from harvest. Cucumbers, squash, zucchini are blooming and have small fruit, if it pollinates. Fruit has set on egg plant, but harvest is probably two weeks off. Sweet peas are blooming, probably start picking in a few days. Earliest ripe tomatoes are probably three weeks out, but tomatoes in general are way behind last year's, with steady harvest at least 5-6 weeks away. Re: 2013 - What are you harvesting? Tomatoes are blooming away, but it is so cold. Peppers just showing some blooms. Only some scapes from my shallots, basically used as green onions/scallions. Since I'm a relative beginner to gardening, I do mostly warm weather stuff, and it's been so frickin' cool for the past couple weeks that the only thinngs growing much right now are peas and carrots. But I didn't start those until about a month ago, so I have a ways to go with them. I sowed bush bean seeds two or three weeks ago, and have yet to see a sprout! In one hoop house we have been harvesting swiss chard for about 2 weeks, as well and loose lettuce mix, spinach and radishes. The crazy thing about the swiss chard-- last year I just left it in the ground in the fall after it began to frost at night, leaves and all and did nothing special to it. Put a hoop house over the bed in mid march Id say, and now we are eating chard from it on a regular basis. I also direct sowed a row of chard next to it as my primary chard, but to my surprise it seems I will have double to chard!! First harvest, a handful of asparagus spears yesterday. I guess I could cut some chives or pull a few Egyptian onions. That is it here. Finally harvesting some lettuce, and recently harvested pretty much all of the kale and collards that overwintered and produced new growth this spring. Lovely, what is that purple/blue variety? hendi_alex wrote: Lovely, what is that purple/blue variety? Sorry...for some reason, I can't edit my previous posts. The variety is "red sails", although the leaves are much darker than any red sails I see in google images. Perhaps there is an environmental component to the coloration? Harvesting 3 kings of squash and Garlic. I will have ripe tomatoes in a few more days. We are planning an outer banks trip, hopefully this spring. Guess we will get pretty close by, on the way to the ferry. My daughter is in the middle of the state, does graphic design in Greensboro. You have carrots?? Good grief! just harvesting weeds and perennials at this point: lambsquarters, turkish rocket raabs, perennial buckwheat greens.